The Ultimate Maintainer Golden Shine Kit | Cal Car Cover Co. 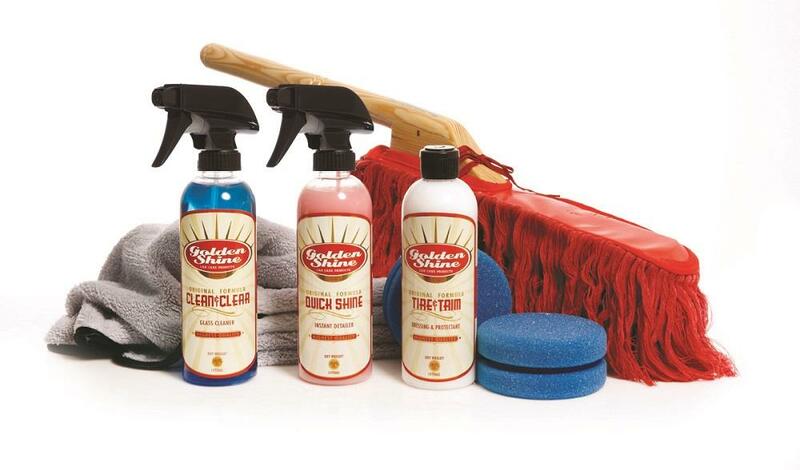 This handy kit includes everything you need to keep that brilliant Golden Shine luster going between deep clean sessions, including our signature wood handle Original California Car Duster that utilizes the proven technology of paraffin wax baked into 100% cotton strands to lift and remove dust and not just push it around. The kit also includes a 3-pack of Quick Shine Premium Microfiber Towels and a 2-pack of Tire & Trim Applicators to use with the 16oz bottles (1 each) of Quick Shine Instant Detailer for reviving that just-waxed look, Tire & Trim Dressing to restore vitality while protecting your dash and tires from cracking and drying, and Clean & Clear Glass to bring out the streak free sparkle of windows and mirrors. Bundled together, this kit offers a savings of $14.95!